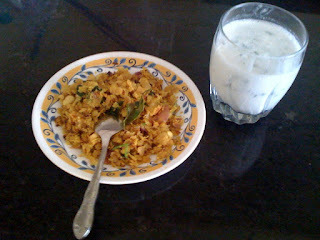 Story: This is my favorite left-over recipe of all times.. It is called kuskara because the act of making small pieces of chapati by hand is called "Kuskarane" in Marathi. The other name - phodnichi poli is easier to understand - phodni means tadka or vaghar and poli means chapati or roti. I am sure Gujarathi folks make some version of this recipe - I wonder what it's called - vaghar ni roti? So if you have a lot of leftover rotis - Not to worry.. The recipe is really really simple - Here's the bottom line: Make tadka - put pea nuts and onion in the tadka followed by the small pieces of roti! Make small square pieces of the rotis by hand. Some folks put the rotis in the blender - but that doesn't work for me - I need that coarse texture of the hand made pieces. Keep these aside. Heat oil in a pan and to the hot oil add asafoetida and mustard seeds. Once the mustard seeds start to crackle, add turmeric powder, green chilies and curry leaves. Your tadka is ready! Add peanuts and onion to the pan and saute for little over a minute. Add the roti pieces and saute for 3-4 minutes. Cover the pan if you like the kuskara to be on the softer side. I like it nice and crispy - so no cover for me. Add salt, 1/2 tsp sugar and lemon juice. Stir well and serve with buttermilk or lassi. I would call it "khakhra no chevdo", if it was crispy. Otherwise "Vaghaareli rotli" might work. But that's just me. And I'm usually wrong in these matters. This recipe is really simple to follow, and does not require too much time to prepare... which means that it is not time-consuming!